We’ve been away. And now we’re back to the crazy heat of LA. It had been impossible to do anything in the daytime for at least a fortnight until it finally cooled off last weekend. Which meant the weather was finally to my taste, and we could hit the beach. Manhattan Beach for a change. Lunch at Captain Kidd on Hermosa Beach was pretty good and not too expensive for fresh and varied seafood. The oysters were pretty good value at $1/shell. (That’s in comparison to a pound a shell in Scotland.) And I got my bodyboard out for the first time this year. Wiped out on my first outing, and have a massive bruise to show for it. (exacerbated by volleyball afterwards. take my word for it: it’s not fun to bruise a bruise.) Otherwise, a fun day oot. Sunday was meant to be a chill-out day, but we had to work. 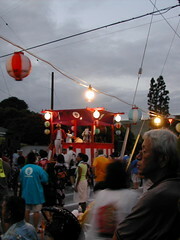 😦 We were rewarded in the evening when an otherwise ordinary trip to the supermarket ended in several hours of dancing ancestral worship that is the Obon festival on La Grange in Sawtelle. We had some pretty tasty Japanese fast food: beef teriyaki, char siew udon and shaved ice with red beans (kintoki). But we mainly had our sights set on having an imagawayaki to finish off the day. Blueberry flavour to boot. Not one I’ve ever had before. Alas, it was not meant to be. Having waited to digest our meal, we joined the super-long queue, only to be told 20 minutes later that they could only make one more batch of imagawayaki, and everyone in front of us had asked for the final 28 cakes. We were, understandably, inconsolable. And spent the rest of the night throwing metal rings at money in a pit. (Some funky ring-throw booth.) I came pretty close to winning a $20 note. Close, but not close enough. 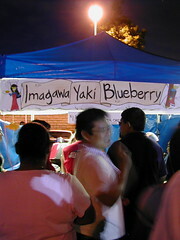 But even a win would not have made up for the loss of the blueberry imagawayaki. Oh yeah. And there was a lot of taiko-led dancing on the street outside. Some of it with fans and all. 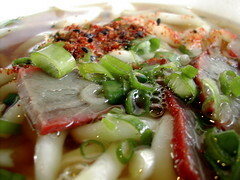 This entry was posted in akatsuki eats and tagged lalaland, music, obon. Bookmark the permalink. bah. no imagawayaki? unfair! i really can’t imagine how a blueberry one would taste, but it sounds heavenly. Blueberry would probably be the perfect filling for summer: light, not too sweet, and slightly tart. Ach. I’m still kicking myself… Hopefully there’ll be a next time.